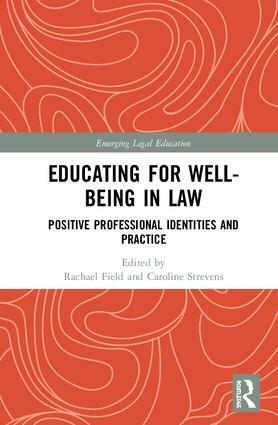 Bringing together the current international body of knowledge on key issues for educating for well-being in law, this book offers comparative perspectives across jurisdictions, and utilises a range of theoretical lenses (including socio-legal, psychological and ethical theories) in analysing well-being and legal education in law. The chapters include innovative and tested research methodologies and strategies for educating for well-being. Asking and answering the question as to whether law is special in terms of producing psychological distress in law students, law teachers and the profession, and bringing together common and opposing perspectives this book also seeks to highlight excellent practice in promoting a positive professional identity at law school and beyond resulting in an original contribution to knowledge, and new discourses of analysis. Chapter 11: Resilience, positive motivation and professional identity: the experience of law clinic students working with real clients. Rachael Field is a Professor in the Law School at Bond University, co-director of the Bond Dispute Resolution Centre, a member of the Executive of Bond’s Centre for Professional Legal Education and co-founder of the Australian Dispute Resolution Research Network. She is an Australian Learning and Teaching Fellow and a Senior Fellow of the Higher Education Academy. In 2010 Rachael established the Australian Wellness Network for Law, which holds annual Forums on well-being issues in legal education and legal practice. Rachael volunteers at the Women’s Legal Service in Brisbane and has been president of the Service since 2004. In 2013 Rachael was named Queensland Woman Lawyer of the Year. Caroline Strevens is a Reader in Legal Education and Head of the Law Department at the University of Portsmouth and Chair of the Association of Law Teachers. Caroline’s academic career was preceded by a career in legal practice as a Solicitor. She established the suite of qualifying law degrees and was appointed the first Head when the Department was formed in 2008. Caroline’s primary research area is legal education. Recently, she has been investigating links between motivation, well-being and ethical decision making. Her most recent publication is entitled ‘Perceptions of Wellbeing in Law Teachers’ has been published in the Law Teacher. Caroline continues to work with international collaborators to promote of well-being in legal academics and junior lawyers. Emerging Legal Education is a forum for analysing the discourse of legal education and creating innovative ways of learning the law. The series focuses on research, theory and practice within legal education, drawing attention to historical, interdisciplinary and international characteristics, and is based upon imaginative and sophisticated educational thinking. The series takes a broad view of theory and practice. Series books are written for an international audience and are sensitive to the diversity of contexts in which law is taught, learned and practised. Meera E. Deo is Associate Professor of Law at Thomas Jefferson School of Law in San Diego, California. She has held visiting positions at Berkeley Law and UCLA School of Law. She holds a Ph.D. in Sociology from UCLA and a J.D. from the University of Michigan Law School. Her nationally recognized, mixed-method empirical research is focused on institutional diversity, affirmative action, and solutions to intersectional (race/gender) bias. Paul Maharg is Distinguished Professor of Practice - Legal Education at Osgoode Hall Law School, York University, Toronto. Prior to that he was Professor of Law in the Australian National University College of Law, Canberra, and is now an Honorary Professor there. He is a Fellow of the RSA (2009), was awarded a National Teaching Fellowship (2011), and is a Principal Fellow of the Higher Education Academy (2015). He holds the positions of part-time Professor of Law at Nottingham Trent University Law School, and Visiting Professorships in the Faculties of Law at Hong Kong University and Chinese University of Hong Kong. Elizabeth Mertz is John and Rylla Bosshard Professor at the University of Wisconsin Law School and Senior Research Faculty at the American Bar Foundation; in addition to her JD, she holds a PhD in Anthropology, and specializes in linguistic as well as legal anthropology. In recent years she has spent time as a Visiting Fellow in the Law and Public Affairs Program and a Visiting Professor in the Anthropology Department at Princeton University.